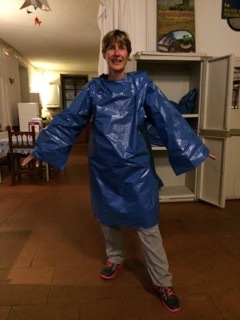 If you had a wonderful time on the Camino and would like to give back, consider becoming a Hospitalero/a and working for two weeks in Spain of France. The training we provide is the same as is offered in Spain, Australia, South Africa and the USA. The weekend is lots of fun and at the end, you'll feel confident about being in an albergue, welcoming and helping pilgrims. Training in Ottawa will be on the first weekend in March, 1st-3rd. (starts Friday evening and ends by 4pm on Sunday)Victoria will be on the weekend of April 5-7 and Calgary on the weekend of April 26-28. Monique Rigole mrigole5(at)gmail.com for the Calgary training. What a shame it is to be leaving Salamanca, the most beautiful city in Spain (according to guide books, & I concur) just when I was learning to navigate my way around this maze of calles and ruas without the use of GPS (10% of the time). I had it all: the good, the bad, and the ugly: the homeless guy who, as we know, is not allowed to stay at albergues (this saga includes a peregrino telling him where he could obtain a credencial, a visit by the police, and me staying up till 1 a.m. waiting for him to come downstairs, which he did twice, my eyes boring into him as if to say "I'm watching you, buddy); a juvenile delinquent with anger management problems who demonstrated this in a horrific outburst while his handler was out buying groceries (a lot of shouting and swearing in German that evening); the "ugly" Spaniard who went ballistic each time I explained one of the hostel rules to him - he even demanded the gate key so that he could return at night after the albergue was closed (needless to say I didn't give it to him). Thanks to Mary et al in Victoria, who prepared us for every possible situation. (I wonder if Kickboxing-for-Dummies could be added to the curriculum). But then there were those magical moments that made it all worthwhile: the famous Korean author (who is the reason why so many South Koreans walk the Camino) who stopped by for a visit just so that she could lie one more time in an albergue bunk bed; sharing a bottle of wine in the evening with peregrinos while discussing art and politics in three languages; the young German woman who had absolutely everything she owned strapped to her bike, including her viola - she entertained us in the evening with some of her own compositions; taping together a raincoat (or more accurately raindress) from the thick blue plastic bags that are used for storing knapsacks (but which are then thrown out, not recycled) and giving a fashion show for the peregrinos complete with runway walk (the runway being the bicycle ramp into the albergue). I called my new line Helen's Camino Fashions. All this and more....... I had it all. 1) The hospitalero hug is hugging on the left side (heart to heart) and holding it for 3 seconds. 2) Italian Stallions give you a kiss on each cheek when they leave. Try to pick yourself up off the floor with dignity. 3) The charming Spanish will hold your hand in theirs and kiss it, their liquid black eyes making you melt. Pull yourself together! 4) Beware of the French with their make-me-swoon accents. Try not to follow them out the door. (Next time I am definitely going to request an hospitalera gig on the French side of the Pyrenees). 5) And on a more practical note, the police will courier a forgotten passport or ID card to the next albergue. Hello Fellow Pilgrims and Hospitaleros, I sit in a couch in the Seminario Menor (albergue with both communal and private rooms) in Santiago de Compostela with wind and rain lashing at the windows. It is a golden opportunity to reflect and report on my gig as a volunteer at Quinta Estrada Romana, a private albergue in Portugal, 11 km south of Tui. My fellow volunteer, young Sara just graduated from Tourism and Business Management and said the job was described as 5 hours/day, 5 days a week. In fact we worked 16 long hours every day. I fell into bed at 10:30 PM with all my clothes on, rolled out of bed at 6:30 and continued working. At about 10:30 AM, when there was a lull, I showered and changed. I thought whimsically of the advice to take time for one's self, and turned a 2 minute shower into 4 minutes. There are 15 beds, 3 of which are double, so we had up to 18 guests + the 3 of us (including the manager Giuseppe), and one weekend Giuseppe 's 2 friends. We changed the fitted sheets (no top sheet) every day, the sheets and towels into W/M and the hung it all out to dry. This process involved a lot of stairs and took till mid-afternoon. At the same time we vacuumed and washed floors, cleaned bathrooms, made the beds, emptied garbage cans from each bathroom (not allowed to put toilet paper into toilets). We served breakfast and supper to guests; supper had to be appetizers, green salad or soup, choice of meat or vegetarian main meal, and dessert. At about 8:30 PM the 3 of us would have a 20 minute supper outside, then start washing (yes, by hand), supper plates dessert plates, wine glasses, water glasses and cutlery and of course all the pots and pans and serving dishes. All this was amidst really loud music playing, adding to the general chaos. The surprisingly positive thing was that Giuseppe 's favourite music is music that I listened to in my younger years!!! The albergue is also a café so between breakfast and supper we served light meals, coffee and refreshments (all this while hanging up laundry). We were put in the same space as the guests for sleeping, which for me meant no sleep at all. After 2 nights I moved into a tent outside, where, as the albergue is out in the country, all dogs in a 500 meter radius barked all night long!!! I gained a reputation as Canadian because 1) I slept in a tent, 2) coerced the dog, which had been carrying a decaying rabbit in its mouth for 3 days (even through our kitchen) to give it up, and finally 3) knew how to set mouse traps. My two co-workers, both vegetarian, were happy to let George, the errant mouse, live in the kitchen forever, but I pointed out that George would soon become many more, not to mention the fact that days were getting colder and more mice would be looking for warm homes. Indeed, by the time I left, the place was overrun with mice... not a nice thing for pilgrims and guests to see. The cast of characters was always interesting. About 80% of our guests were German. One evening a group of 8 burly red-neck Portuguese arrived in a fire truck. They made everyone wait with supper, were loud and rude and left the next morning without a word of thanks or even a goodbye. They were offset by the most lovely Italian/Swiss couple, true pilgrims in every sense; they were humbly grateful for our efforts. One group of Portuguese arrived at almost midnight. As I am a light sleeper, I awoke to greet them. A short while later Giuseppe arrived. He looks like a pirate in daylight, so I can't even imagine our guests ' reaction. Young Sara coloured everyone's stamp differently. Our brief rest in the evening when we had supper outside was always with wine and by candlelight. One evening 3 Italian Stallions arrived. Michelangelo's David could only have been carved in Italy. These young men were so hot, my eyes smoked whenever I glanced their way (for purely observational purposes). Giuseppe 's friend Vicenzo was a parody of what a North American thinks an Italian is. One night he was given a piece of parmesan to grate. A half hour later he was still talking passionately, waving his arms in the air, cheese still in hand and nothing grated. He would sit outside greeting everyone who passed by: (you have to say this with an Italian accent): "Buen Camino!!!! Come!.. relaxa yourself... hava fruita shake!" We had more café customers when he was there. There were 4 cash boxes: one for overnight guests, one for café purchases, one for tips and one for the fruit shake bar... and we were not allowed to mix them up. However, we never had change!!! People would pay for a 1 Euro coffee with a 20 euro bill. It was so frustrating!! One day I asked Giuseppe, who went to town every day for groceries, to bring a 50€ bill to the bank and exchange it for 50 X 1€. I had to explain this novel concept 3 times (even though he is a young 34 years). He replied that they don't do it that way. It was the same thing with appetizers. He always served them at the same time as supper. I suggested serving them 1/2 to 1 hour BEFORE supper (I know that pilgrims were getting hungry). He wouldn't even try it once!!! And then it was 6:30 AM again, my quiet time as I got the breakfast table ready. After this interesting interlude, I continued my camino, which had started in Porto. In Santiago I await the arrival of Sara. Together we will walk to Finisterre (amazingly no blisters!!). I have a second gig in Salamanca the first 2 weeks in November which is ONLY registering guests at 4:30 PM. Well here it is, 4 more days till the change over. I can't say time has flown by as days are long with a mixed bag of highs and some challenges. This is a big Albergue with many people so you an imagine anything can happen with a couple of pilgrims showing up with bedbug bites that we address with bagging their backpacks and belongings and leaving them in the sun all afternoon followed by 2 machine washes and then dryer. We also separate the pilgrim a distance from the others. We have delayed the opening by one hour, to give us time to clean up. I am not in agreement with my fellow hospitalera and hospitslero for the opening hour as I think we should wait a couple of hours for the smell to dissipate at least once the floors are cleaned, etc,. The trouble is they had to open up the floor in the dorm which compounds issues. However, I am trying to be patient as the majority is ruling. So my fellow class mates, I took time out and came to this lovely Bar for a good cafe con leche and 2 pinchos, which I am really enjoying in the sunshine and fresh air! I have been in touch with my Canadian replacement and look forward to meeting him and his wife. I see the necessity of volunteering with a veteran Spanish hidpitslera/o as there have been several issues that came up that needed someone fluent in Spanish. Time to go now to prepare for the opening. Let’s hope the plumbing stays working. Oh yes, before I forget, another high is that the WIFI is back today after yesterday’s power outage/ yahoo! We have reports from Lois in Nájera and also from Helen in Quinta Romano Estrada. First of all Julie, from Australia, was one of the 4 hospitaleros who we replaced. Julie is also a qql/a trainer in Australia, so Mary and Tom probably know her. It was a very good change over the day before we started and I was sad to see her go. I felt we could have made a great team. Anna is from Spain and Pascalli is from Italy, and French is our common communication. Language is not an issue but it really helps that Anna speaks Spanish as half of the pilgrims seem to be Spanish. This is a 90 bed Albergue but so far the most we have had is 65 for the night. The other days were 43, 44, 39. It looks like the numbers could be low again tonight as it is almost 5 pm. It is hot out today so more may be arriving in the next couple of hours due to walking slower from the heat. We do not prepare meals but there is a kitchen and plenty of restaurants nearby. We are very lucky as we are welcome to eat at one of the restaurants once a day. Yes, the food is good and a bottle of wine and a bottle of water are placed on the table. The kitchen is usually packed with pilgrims making dinner so it’s great to skip out for dinner. Anna and I share a room with bunk beds, and Pascalli has a room of his own.This is day 4 and I find the days long as we begin early in the morning and go till 10. Tonight we had 45 pilgrims.Doors open at 1 pm so before that we do all the cleaning after we have breakfast once the pilgrims have left. We usually finish cleaning around 11. The laundry can taken longer as we hand out real sheets and pillow cases and have to wait for the loads to finish.Then it’s shower time for us and then off to pick up supplies for the Albergue or ourselves for breakfast or lunch items. In my free time I have managed to visit a market, walk about town, and attend a mass for the pilgrims. This weekend we will visit a monastery as someone comes in to clean for us on Saturdays and Sundays- lucky us! It’s 10:30 now as the church bell rings once on the half hour. I am lying on my bunk in the dark, cozy in my sleeping bag and feeling settled gor the night. A suggestion I have is that you arrive a couple of days ahead before coming to the Albergue, so that you give yourself more time to adjust to the new time zone. I am on the bus from Lugo to Madrid. Not too much to report over the past week. I was worried about the handoff to our successors, because Michael had to leave early on the morning of the 15th, and I had no info when our successors would arrive. I needn't have worried. Jesús arrived early morning on the 14th and Juan later that day. And both had already served several times before. 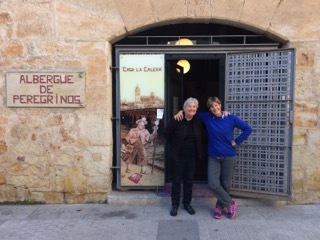 Michael and I had ample time to pass on our personal suggestions about the albergue and monesterio. Jesús and Juan were not much interested in the Samos cleanup procedures that my predecessor Migual gave me--I'm sure that they had their own established patterns after several postings. I got into the Taxi for Sarria at 7:30 this morning, confident that the albergue was in good hands. A very nice lady of unknown nationality came up to me in front of the Albergue a few days ago. After a bit, she started searching in her coin purse. To my surprise, she pulled out a muñequito, just like the one I wore around my neck, and held it up for me to see. Una Hospitalera! We hugged, chatted a little, and she went on her way. And just 2 days ago, a very tried Peregrina came in, looking absolutely beat. I gave here a glass of water, and assigned her a bed. She headed over to her bunk to rest up, when I noticed the cookie package that thoughtful Michael had bought to hand out to the peregrinos, with just one cookie left. She accepted gratefully when I offered the cookie. Not quite the end of the story. The next morning she came over to me at the table and asked if I'd stand with her for a photo to remember me by. Michael joined us while a peregrino snapped a photo with her cell phone. It's a wonderful feeling knowing that you've been able to help peregrinos. I will close these notes for now with a heart-felt thanks to Mary, Monique, Daphne, and all my classmates for preparing me for this wonderful adventure. And to Michael, my compañero, and to Miguel and Manuel for their patience in bringing a new Hospitalero up to speed. And to all the Peregrinas and Peregrinos who make the Camino the incredible miracle that it is. One week into my posting--half way done. I'm still learning my job, but, aren't we all? A major step for us was to establish a better way to communicate with our monesterio contact, Father Cristobal. For a while we were using the gift shop attendant to pass handwritten notes to Father Cristobal. Now we use email with Translate which is easier, quicker, and more reliable. I write the message in English, use Translate to produce the Spanish text, then paste the translation into the message in front of the English. ‘Works great. When his reply comes back in Spanish, i just select his text, click on Translate from the popup menu, and, viola, I have his response, more or less, in English. Yesterday Michael and I did our 2nd laundry. The beds have fitted bottom sheets and there are fabric pilliow cases. We try to wash any bed linens, that have been used, at least once per week. We have paper “linens" available, but we distribute them only upon request. The way it works here at Samos is that we ask Father Cristobal for a time when we can have access to the washing machine. There are no automatic dryers and so everything must be hung on the lines. Some of the sheets and pillowcases have waterproof plastic linings, so we reverse them while drying to avoid a wet side. So far we have been lucky with the weather. I hope that continues for the next week. Very tasty paella and chicken. On Thursday we encountered our 1st bedbug. Fortunately, my companero had dealt with bedbugs before. We moved the perregrina to another bed, then I bought some insecticide from the local supermercado which we sprayed judiciously on the bed after mopping the next morning. Hopefully that will be the end of the bugs for a while. I should mention that Michael’s prior Hospitalero experience has been invaluable. I suspect that Anai tries to pair newbies like me with experienced Hospitaleros, to smooth the newbie learning curve. It's interesting to see the behavioral patterns of the peregrinos. Some days they are very quiet, staring at screens. Other days, very boisterous and outgoing. Groups of Italians are invariably enthusiastic and talkative. Our peregrino count peaked last Saturday, and has been declining since. Michael expects an upturn today (Saturday). I'll try to write a final note a week from Sunday on the train back to Madrid. I send you greetings from Monesterio San Julian de Samos. Now my question. This afternoon, two Spanish-speaking women came into the albergue asking for a stamp on their credencials. I had seen my predecessors stamp credencials for individuals who did not stay at the albergue, so, I said "OK." They sat down and one pulled out about 6 new-looking credencials with 5 or 6 stamps on them. She proceeded to write tomorrow's date on one credencial, grabbed our stamp, and stamped it. Then she started to write tomorrow's date on the rest. I grabbed the stamp and told her that I would only allow stamps with today's date. She argued that it was just for mañana. I refused, and, she left, calling me foul names in Spanish (at least, my companero, Michael, told me that's what she was saying. 1. Is it ever OK to stamp credencials for peregrinos who just want a stamp and don't plan to stay? We've averaged, ~5 such requests per day. 2. What might have been this woman's game? 3. What would you have done? So Hospitaleros, what would you have done? Anybody else have this happen?